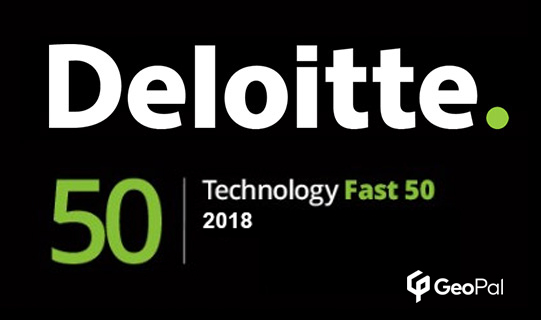 DUBLIN, IRELAND - (October 19, 2018): GeoPal, a leading provider of Field Operations Management solutions today announced it has been named as one of the top 50 fastest growing technology companies in Ireland in this years Deloitte Technology Fast 50 Awards. Exact rankings won’t be made available until the awards ceremony which takes place on November 2nd at the Clayton Burlington Road in Dublin. The Fast 50 winners in 2017 cumulatively generated circa €858 million in total revenue throughout 2016 with 64% of the companies coming from the software sector. eShopWorld claimed top spot last year for the third year in a row with a 3632% growth rate over the last 4 years. “We’re delighted to be recognised as one of the 50 fastest growing Irish technology companies” explains Gerard O’Keeffe, Chief Executive Officer at GeoPal. “The competition takes into account our impressive growth rate over the past 4 years which reflects the growing number of Utility contractors choosing to use GeoPal to better manage their Field Operations". This award notification has come just a few months after GeoPal was accredited with All-Stars Best Technology Business 2018 at the fourth annual All-Ireland Business Summit at Croke Park.